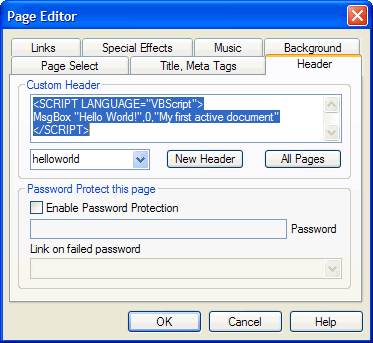 Add custom header information to your web page using the Header Tab on the Page Editor dialog box. Custom Header Select a header from the Header Selection dropdown menu, or click the New Header button. Enter script statements, style sheet declarations, or other custom header information to be added to the <HEAD> section of the current page. Header Selection Displays the header object currently selected for editing or [no custom header] if no header object is selected. Select a different header object from the drop-down menu. New Header Click to add a new header object to the Header Selection drop-down menu and to select the new header object for editing. You may rename a header object by typing over the displayed name in the Header Selection box. All Pages Click to apply the currently selected header object to all pages in the project. SiteSpinner® Pro’s page-level password function is not secure or encrypted. For robust, site-level password protection, contact your web host. Password Enter an alphanumeric password that the user must match when the password option is enabled. Link on failed password Enter the URL of the alternate page to display when the user fails to enter the valid password to view the current page.